March Madness is the time of year when the saying “anybody can beat anybody” becomes a staple of college basketball vocabulary. It’s when the underdogs get their moment in the spotlight to show who they really are and who they can beat. The Tech men’s basketball team is trying to be one such underdog and spoil the hopes and dreams of the teams ranked above them. Five seniors played for the Jackets in their 63-59 win over the Panthers: the dominant rebounding forward Charles Mitchell, three point sharpshooting graduate guard Adam Smith, the offensive centerpiece Marcus Georges-Hunt, the point scoring forward Nick Jacobs and the jack of all trades graduate transfer forward James White. As usual, the brunt of the scoring fell onto Smith, Georges-Hunt and Jacobs, but all seniors put forth important efforts towards the win. Smith led the Jackets with 23 points and cemented his spot as the best three-point shooter in the ACC, going 5-for-7 from beyond the arc. Jacobs and Mitchell led the team with 12 and 11 rebounds, respectively, while Jacobs augmented his rebounding performance with 19 points, going 6-for-14 from the field and 7-for-9 from the free throw line. White and Georges-Hunt had less stellar performances but still managed to contribute on both sides of the court, with White being instrumental in shutting down the Panthers offense. In addition, all the seniors have put forth amazing efforts throughout their careers. Smith, the graduate transfer from Virginia Tech, has 1,476 career points with 771 of them coming from three-pointers. He is currently leading the ACC this season in three-point field goals per game at an average of three a game. He is the first Tech player to score 30 points in a game since Iman Shumpert in 2011, and his eight three-pointers in the same game were the most since Drew Barry in 1996. Finally, his 93 three-pointers this season are the most for any Tech player since Tony Atkins in 1998. 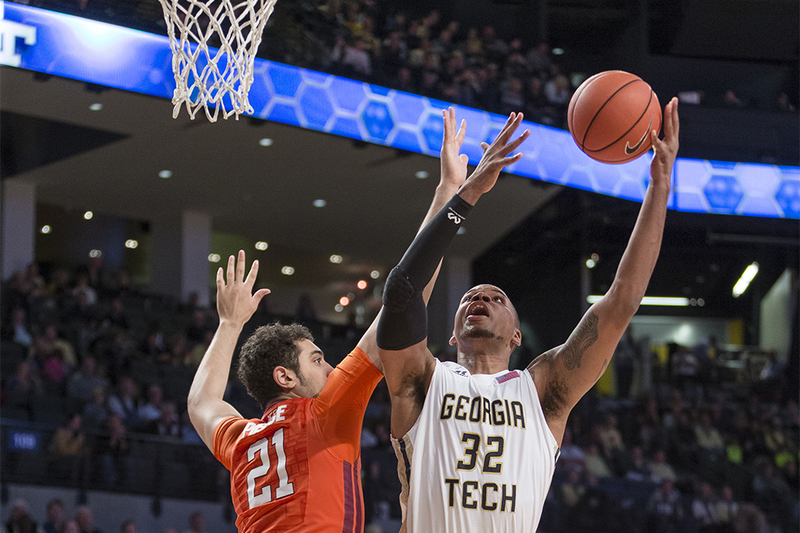 Georges-Hunt has been a pillar of the Tech basketball team all four years he has played for the Jackets. Through those four seasons and 125 career games, Georges-Hunt has 1,642 career points and is currently leading the team with 515 this season. He has 118 career steals, 262 career blocks and is the 19th player in Tech history to have 1,000 career points and 500 career rebounds in a Tech uniform, courtesy of sports-reference.com. Jacobs, the transfer from Alabama, surpassed the 1,000 career points mark in his final regular season game. In addition, he has 530 career rebounds and scored in double digits in seven straight games this season. As a key part of the game in the post, he was second leading rebounder for the team and third leading scorer. White, the graduate transfer from Arkansas-Little Rock, was a key part of the Tech defense this year, averaging 14.5 minutes per game while being the second leading blocker. In addition to this, he shot 49 percent from the floor and averaged 4.3 rebounds per game, making him the team’s third leading rebounder. The men’s team is still considered on the bubble for grabbing an at-large bid to the NCAA tournament, so the ACC tournament will be a good place to show why they deserve to go to the big dance. The Jackets finished the regular season with an 18-13 overall record to offset their middling 8-10 ACC record. Tech continued its hot streak in a compelling 88-85 overtime win against rival and ACC opponent Clemson. The Jackets faced No. 2 seeded University of Virginia in the conference tournament’s quarterfinals at 7 p.m. in Washington, D.C., a matchup that tipped off after the time of writing.